The latest expansion for The Elder Scrolls: Legends (Free) , Alliance War, is coming up fast. It arrives on April 15, bringing with it more than 100 new cards and five new three-color house card combinations. We’re not saying we have a line on what one of these cards might look like, but … okay, yes, we definitely do. Thanks to the fine folks at Bethesda, we’re excited to exclusively reveal the new Alliance War card Invoker of the Hist. Your eyes might already be drawn to the Invoker’s Veteran ability, which restores your magicka when triggered. It feels like a potentially wild new mechanic, so we got Christian Van Hoose, Community Manager, The Elder Scrolls: Legends, to tell us more about the thought process that went into it. Invoker of the Hist’s Veteran effect can be huge if you have a lot of cards you want to play but you’re tight on magicka. As a 3/6 for 6 magicka, Invoker won’t be the most powerful creature on board, but if you’re able to keep it alive for one turn in order to attack with it, you’ll be able to really open up your options. On turn seven, you can play seven magicka worth of cards, attack with Invoker, and then play seven MORE magicka worth of cards! 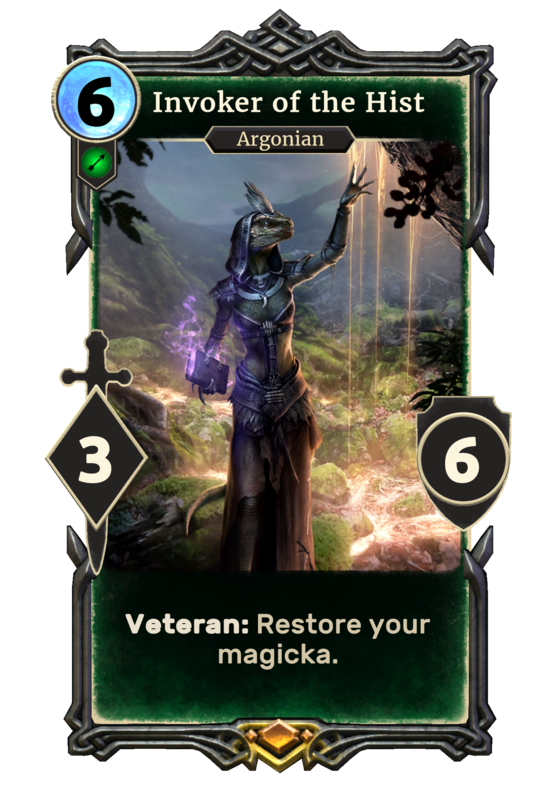 This is the first time we’ve seen magicka restoration in Legends and it will be interesting to see how players take advantage of the ability. Yeah, “interesting" is right. Bethesda has already provided a glimpse of some of the other Alliance War cards on its own site, though undoubtedly some of the most mind-blowing new mechanics are being saved for when the expansion goes live. This seems like the correct time to remind you that if you simply can’t wait until next week, you can pre-order Alliance War inside The Elder Scrolls: Legends for $49.99, which gets you 50 card packs and a Legendary card from the expansion, along with an exclusive ‘Warmonger’ title and a premium card back. All of those will be in your grubby digital mitts on April 15. I’m already looking forward to you beating me with this very card I helped show you ahead of time. That’s a strange form of gratitude, but I understand.